The staff members at Downtown Akron Partnership come into contact with a wide variety of people when we are out and about in the community visiting businesses, participating in community events, making connections between stakeholders, and promoting Downtown Akron. We continually hear from residents, employees, students and visitors who are inspired by the positive energy in Downtown and the revitalization that has happened here in the last several years. We love telling the story of Downtown and talking about all of the businesses, organizations and people that make Downtown so welcoming and vibrant. DAP’s new “Distinctly Downtown” feature is a way for you to find out about all of the wonderful things going on in Downtown Akron. Each week we’ll shine a spotlight on the places and faces that make Downtown Akron unique! What makes Downtown Akron so distinct? Find out here! We hope to see you soon in Downtown Akron! Located on Maiden Lane in the same building that houses Musica and Urban Eats, NOTO is a charming boutique that offers a selection of chic women’s clothing and accessories, all offered at a price to suit any budget! Stop by and visit the infamous blue couch, take a seat and talk fashion! An array of vintage shoes priced under $20, blouses and dresses made from great fabrics and colors, and a variety of trendy accessories are just a few of the reasons to explore NOTO. The fresh spirited style of owner Lauren Ward radiates through NOTO and makes it the boutique to find original fashion Downtown. Purchase an outfit that provides comfort and style to embody a busy schedule or a fabulous piece for your next night out and you’re sure to receive praise from admirers! Keep up to date with NOTO’s blog at http://zelionoto.blogspot.com/, where trend reports and fun new items are posted regularly. 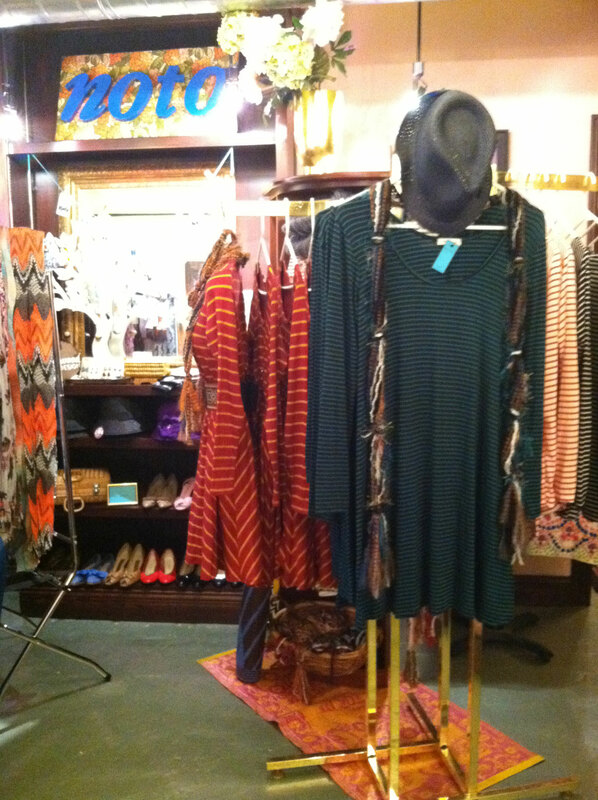 Keep an eye out for details about NOTO’s yearly fashion show featuring items that may be purchased in the boutique!